If you're still using Picasa to do this, you're in for a rude awakening next time you try to click that green button - or any option for "Upload." 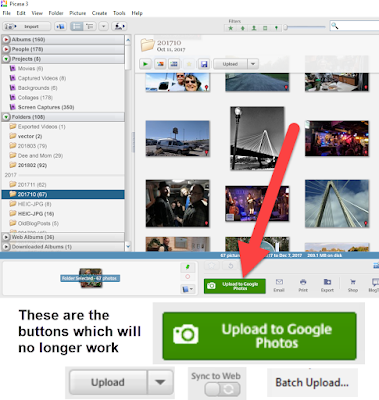 If you don't use any upload or sync options with Picasa, then you have nothing to worry about. The Picasa software on your computer still works for managing your folders of photos on your computer, for editing them, and for making collages. You'll just need to use other methods to upload them to your Google Photos account online. The official announcement is in the Google blog here. This shouldn't be a surprise to anyone, it's been predicted ever since Google retired the Picasa program. The problem is that we've been lulled into a false sense of security by the fact that the upload from Picasa has continued to work as long as it has. Just last week, I used Picasa to upload pictures from my computer to Google Photos, now "all of a sudden" it doesn't work. If you want to know how to upload photos to Google Photos from your computer, that was the subject of Episode 138 of What does this button do? What do I do to upload my photos from Picasa to google It is sooo frustrating. Every time I edit my photos and put them on facebook, all my editing goes down the drain. I have tried countless times to put them on google. It just doesn't work.